Vestibular Infant Screening – Flanders: the implementation of a standard vestibular screening protocol for hearing-impaired children in Flanders. Int J Pediatr Otorhinolaryngol, 120 (2019), 196-201. Comparison of the Motor Performance and Vestibular Function in Infants with a Congenital Cytomegalovirus Infection or a Connexin 26 Mutation: A Preliminary Study. Ear Hear, 38 (1), e49-e56. Maes, L., De Kegel, A., Van Waelvelde, H., De Leenheer, E., Van Hoecke, H., Goderis, J., & Dhooge, I. (2017). Early motor development of children with a congenital cytomegalovirus infection. Res Dev Disabil., 48, 253-­‐261. De Kegel, A., Maes, L., Dhooge, I., Van Hoecke, H., De Leenheer, E., Van Waelvelde, H. (2016). Examining the impact of cochlear implantation on the early gross motor development of children with a hearing loss. Ear Hear, 36(3), e113-­‐e121. De Kegel, A., Maes, L., Van Waelvelde, H., et al. (2015). Association between vestibular function and motor performance in hearing-­‐impaired children. Otol Neurotol, 35(10), e343-­‐347. Maes, L., De Kegel, A., Van Waelvelde, H., & Dhooge, I. (2014). Rotatory and collic vestibular evoked myogenic potential testing in normal-hearing and hearing-impaired children. Ear Hear, 35(2), e21-­‐32. The influence of a vestibular dysfunction on the motor development of hearing-impaired children. Laryngoscope, 122(12), 2837-­2843. De Kegel, A., Maes, L., Baetens, T., Dhooge, I., & Van Waelvelde, H. (2012). 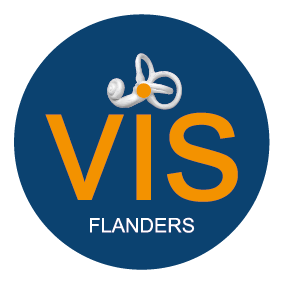 An introduction of the VIS-Flanders project was published in the newsletter (summer edition 2018) of VLOK-CI for their members.